A COUPLE of minor alterations helped Hard Go Jo land her first win for her new stable at Murrumbidgee Turf Club on Monday. Hard Go Jo was having her fourth start for Wagga trainer Chris Heywood when she broke through for a strong win in the Knights Meats & Deli Class One & Maiden Plate (1600m). 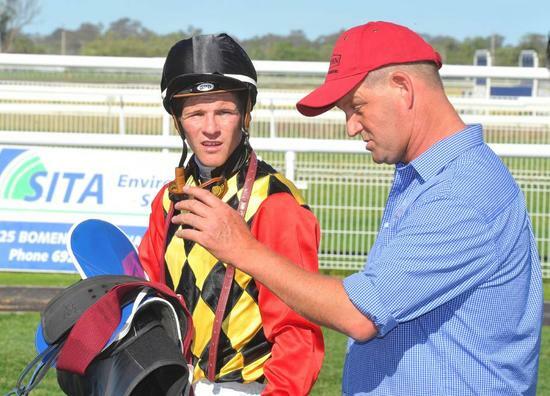 Hard Go Jo won her maiden in Victoria for Matthew Williams and spent time with Danny Williams at Goulburn before joining Heywood. Nick Heywood made another successful trip home to land the win for his dad with Hard Go Jo. “It was a big drop in grade,” Chris said. “She had been running in Benchmark 50s and 55s against horses that had won four and five races, coming back to a class one and maiden. “We took the shades off, went with the winkers. We knew her best wasn’t far away, she had just been over-racing a little bit too much. Heywood is now confident the mare can get up to 2000 metres after she fought off $4.40 equal favourite Footmark by a half neck after a cracking duel down the straight. “Today she really fought on, given we rode her with a little bit of cover, she had that little bit up her sleeve, which was good. The Heywood team also had a couple of near misses with Lighthouse running second and Fermanagh Lad finishing third.